a banjo. a guitar. a ukulele … and some knitting. – static confusion. a banjo. a guitar. a ukulele … and some knitting. it is a winter night and all you want to do is rock up to a dark room, the flames of a fire and sip on the local beer on tap. one of my favourite melbourne haunts, the wesley anne. 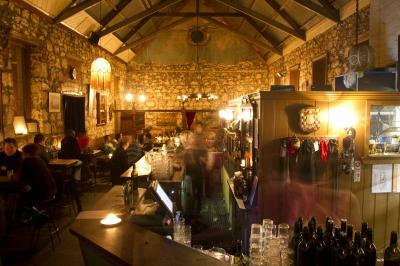 venue if choice: the wesley anne, the high street local that is rich in old stable decor. her major source of light is simple old-fashion candle. as timeout magazine describes her, she’s “venerable … one of melbourne’s oldest and prettiest restaurants. housed in a former church, its rough stone walls have seen generations of diners, musicians and sinners in general come and go.”in the scarlett dimmed bandroom is an eclectic scene of music, craft and humor. it’s genuine really, the artists on stage, strumming their strings. there are three: banjo, guitar and ukulele. performing along in folk harmony. each hum, a different beat yet all are poetic to say the least. it is easy to lose yourself in the artists’ emotional serenade. between the mum of each song i hear the clutter of another noise, rhythmic in of itself–‘click clack’ like a hand clap, it is actually the drum of needlepoint. the show is an audience of knitters. the lass next to me is piecing a cardie, another lady is sewing buttons back onto her grandfather’s jacket so her son can wear it. vintage meets kitsch meets the present. 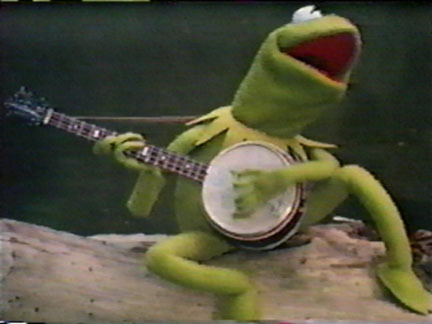 our favourite muppet goes from green to bluegrass. there is a slight distraction by the twiddle of the recorder and the twing of an accordion. an eccentric quirky collaboration indeed: woodwind meets reed meets string.the musicians make their music and the knitters craft their clothing. it’s all art. it’s all quirky. it’s all creatively entertaining. and i am lost somewhere between the fiddle of the ukulele and the measurements of the yarn … when tangled up in the crotchets and the clew these words find me. this sight (and thought) too pure not to share. A truly unique evening. I wouldn’t mind having some more of that warming mulled wine with brandy this winter.